For those of you who celebrated, I hope you had a wonderful Thanksgiving! All that eating is perhaps good motivation for doing some running…! It is time to register for the race! Full instructions and the link can be found on the website here about a third of the way down: http://womenrunningtheworld.com/spring-half-marathon/ It is very straightforward but if you have any trouble, just let me know. The important thing for you all is that you put your race time to be 2:30-2:39. This race is large enough that it will have corrals based on the estimated race finish time. This is so faster runners aren’t stuck behind slower runners and slower runners don’t have to deal with faster runners trying to push their way through. We don’t know yet where you will actually fall in the race times, but this will put us all in the same corral and that is most important thing. Don’t forget – we are planning to do the early morning holiday lights run on Thursday 8 December. Please let me know if you think you can NOT make it. We will send out the specifics next week but we will start at 6 am and you should be back to SJW around 7:15. It really is a special run so I hope you can all make it! I’ve had a couple of people ask about the best way to communicate if they are running late or aren’t sure where the group is going, especially on Tuesdays or for weekend runs. In the past, the beginners would often email each other, but last year, the group created a WhatsApp group that everyone was on. This allowed them to quickly message the whole group about meeting up or to say they were running late or whatever. Just something to consider! Every year, the M/W/F group organises a gift for the employees at our local St. John’s Wood Starbucks. You are welcome to contribute to that effort if you would like. We’re suggesting a £5-10 donation, but feel free to give whatever you would like. We’ll also be donating some home-baked goodies. Give your donation (in an envelope with your name) to one of us before Tuesday 13 December. Please email wrwlondon@gmail.com if you would like to contribute baked treats. We’ll gather the baked goods on Tuesday 13 December and we’ll give the gift to Starbucks on Wednesday 14 December before the M/W/F group run. Please get your gift to us soon if you would like to participate. Last week was HUGE! 3 15-minute segments – that is fantastic. We are SO proud of all of you. This week, we are keeping it steady with the same 15 minute segments. For those of you going away for the ASL break, just do your best to get in the runs. Remember, beginning this week, the Tuesday run is now a total of 45 minutes exercise time and your weekend run should be 30-35 minutes total. Break it up with walk/runs however feels most comfortable to you. Several of your coaches are here on Thursday so we are planning to coach the run as usual assuming there is enough interest. Please respond to let us know if you will be here. Let’s give us an extra few minutes of sleep and meet at 8:30 am. We will do a loop so we can get back to SJW to give time to start cooking. We’re really moving along now in our training and you guys are all doing AMAZING! Last week was another jump and you all took it in stride. We will be going up a bit more this week but we will hold the course for next week for Thanksgiving week. A few years ago, a M/W/F runner suggested the group do an early-morning run to see the lights on Oxford and Regent Streets and it has become a tradition. It is incredible to see the lights when it’s dark and there is no one on the street. We will leave at 6 am and will run from Barclays down to Oxford and Regent and circle back to Bond Street to take the tube home. We should be back in SJW around 7:15, give or take a few minutes, so in time to get the kids to school if you have a little help getting them up. I hope you all can make it. We have some significant increases in our training, but you all are ready – really! But there are some important things we need to discuss, so bear with me because this email is a bit long. 3 runs a week? If you are aiming to do the half-marathon in the spring, you should be adding a third run each week if you haven’t already. It will make the race a lot easier if you can get in a third run at least from time to time. Let’s be clear – it’s never easy running 13.1 miles, but the more miles you’ve put in, the more comfortable your body will be running that distance. 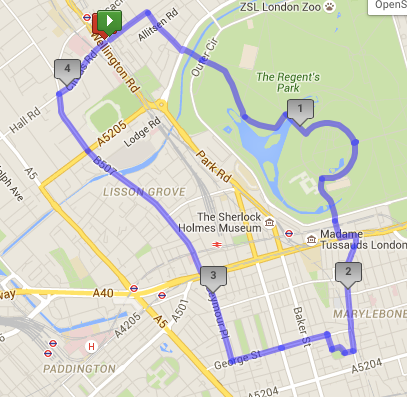 Varying each run – This is the good news….. We have progressed to the point where our runs/routes will begin to vary. 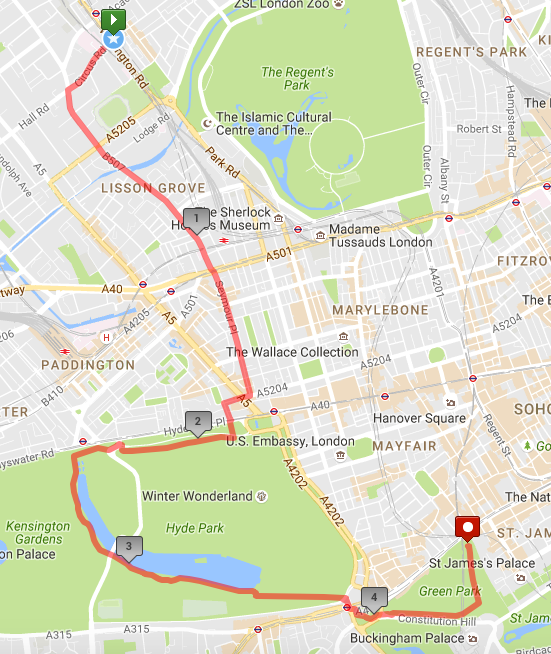 Next Tuesday 22 November (or whichever day you are doing your second run) you will no longer simply repeat the route we did together the previous Thursday. After this week, you will be doing one long run with your coaches on Thursdays, one medium run and for the third weekly run, you will do a short run. The medium run (beginning Tuesday 22 Nov) will be 45 minutes total exercise time. Feel free to break that up into whatever intervals you are comfortable with. If you’re not sure where to start, you could try doing a 5 minute warm-up walk followed by three 12 minute jogging intervals separated by 2 minute walking breaks. The third run should be 30-35 minutes total exercise time. This also can be broken down into whatever length intervals make you happy. A place to start may be…. 5 minute warm-up walk followed by three 8-9 minute intervals separated by 2 minute walks. Particularly for this 30-35 minute session, some of you may be interested in doing a walking warm-up then just jogging slowly until you feel you need a break. Then walk for a couple of minutes and jog some more until you reach the 30-35 minute total time. If you want to try that, here are a few tips. First of all, run SLOW, like what we do on Thursdays. Second, don’t look at your watch. Do your 5 min warm-up then start jogging. Look around, watch the people on the streets or in the park, think about anything but running, notice the yellow/gold/red leaves, make a grocery list in your mind, think about what book you want to read next or where you want to go on holiday…. anything but running. When you’ve had enough, then check your watch to see how much time you did, take a walking break and carry on. You may just amaze yourself. On these additional runs, go wherever you want. 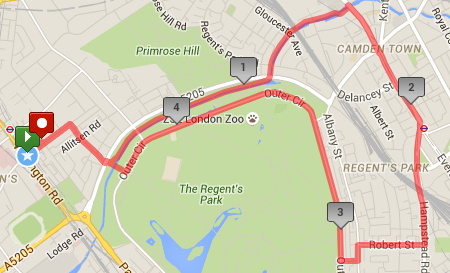 You know how to get to Hyde Park, Regent’s Park is right there, and access to the canal is super easy. We’ll help you come up with some other ideas if those routes get boring. I understand that you have no point of reference, so you have no idea how well you are doing. We’re running 4 miles now, over and over again. I know it’s not easy, but you are doing it. You have the worst of it behind you. It’s A LOT harder going from 0 running minutes to 1 running minute, or from 1 to 2 minutes – those are difficult beyond belief. In the next few weeks, we are transitioning into straight running, no designated walking breaks. That may sound scary, but think about where we run. Even though I say we are running 50 or 60 minutes non-stop, there will be street crossings. You will learn to pray for the little “red-man light”. My message is that you can do this. You have each other to lean on and all of your coaches to help out however we can. Well done this week! That was a big jump up in time – going from 7 minute to 10 minute segments. That’s HUGE! I know it was hard, but you did it! (and then throwing in an extra 5 minutes at the end…) This week we will increase our intervals up to 12 minutes. If you hadn’t noticed, we are increasing our time faster now so it is so important to make sure you are getting at least the Tues/Thurs (or substitute days) in and it will be much easier on you if you are doing that third run on the weekend. It will be easy to suddenly feel like you’re falling behind and we don’t want that to happen! Some of you may be away for ISSTs (the high school end of the season sports tournaments for those of you without ASL high schoolers) this week so just try to get the run in when you can. Jane will be away but the other coaches will be there on Thursday. Don’t forget to keep it SLOW on Tuesdays. You can get an app for your phone – I recommend MapMyRun or RunKeeper – that will track how fast you are running. You should be running between a 12:30 and 13:00 minute mile at the most (and it is completely fine to be slower). I would recommend that one person be in charge of the timing for Tuesdays (I know Tamar usually does this) and another person keep track of the speed. You should pause the app when you walk so you’re accurately timing the run portion. For your weekend run, it’s OK to go a bit faster because it’s for a shorter time and distance. But don’t kill yourselves! Also, Tuesday is the SJWWC holiday boutique (just putting a little plug in here for it). It is totally fine to come directly after the run but bring your credit card! 1) The race hotel website is saying that there are no rooms left but it is a technical issue – we have more rooms reserved than have been booked so far. We will get it straightened out ASAP and let you know when it’s re-open for booking. I know several of you have already emailed to let us know you’re planning to book. 2) We are taking orders for WRW clothing. This is completely optional but your order MUST be in by 5 pm on Thursday. We don’t buy extras and we’ve had people be disappointed in the past so don’t delay if you want to order something. From a sizing perspective, I get a small in the short-sleeve shirt and I’m ordering a medium in the half-zip. 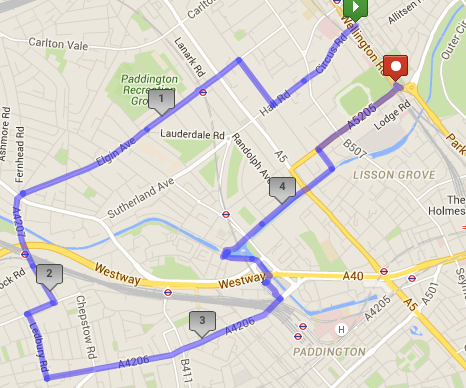 This week for the route, we are going to Notting Hill via Elgin Avenue in Maida Vale. See you Thursday if not before! Sorry for the late email this week – it’s been a crazy week for some reason. We have a jump up in time intervals this week but don’t be nervous – you can do it! You are all doing so well. If you are worried about the time, or feel tired during the run, just slow down. We’re not in a hurry! Do your best to do an extra run on the weekend – it will really help you continue to build your stamina. Some of you have asked about eating before the run. In general, it is good to have something in your stomach before you run, but not too much. The key for all of you is to experiment. A little later, as we are running for longer, I will send a long, information-packed email put together by WRW’s founder, Paula, on the science and theory behind what to eat before and after a run. But I don’t think we need that level of detail yet. For now, you should be trying different things to see what works for you because everyone is different. Personally, I usually have a yogurt or a banana along with coffee and whole milk. It’s enough to keep my stomach from grumbling and will give me a little energy, but won’t sit like a lump. I know other runners like oatmeal or a smoothie or maybe half a bagel with cream cheese. The important thing is to have something. As we start to run longer, you will need a little more energy and it’s good to start trying things now. Also, most of you will experience an increased appetite as a result of this training. That is normal. Many runners will say they didn’t lose a pound when they started running. Usually it’s because you’re hungrier with increased activity levels, so you eat more. Generally, women don’t lose or gain weight in training, but they have more energy, they can eat more and often digestive issues disappear. Let us know if you have any questions about any of this!